Map: The Haftorah takes place in Jerusalem. 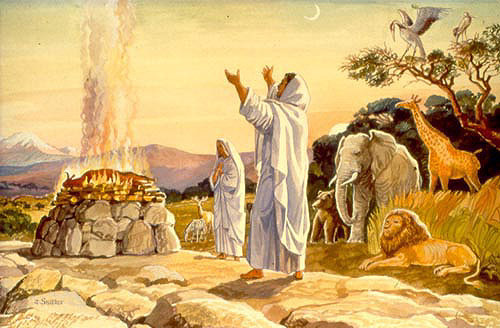 In honor of his coronation, Adoniyahu sacrificed animals at the “Even Hazochelet” that was next to Ain Rogel. Melachim Aleph, Pasuk 9. What was the Even Hazochelet and where was Ain Rogel? Ain Rogel (spring or well), situated then near running water, is located at the South East tip of Jerusalem on the border of Judah and Binyamin, where kings were anointed in that day. Some commentaries believe that Ain Rogel was where women would go to wash their family’s clothes using their feet or in Hebrew “Regel”. The Even Hazochelet of Serpent Stone: Hazochelet means “Shrink back, crawl or slide”. Some believe that young boys would compete in a game to see who could push the stone the farthest. Because the stone was so big, they could only push it a short distance. The connection of the Haftorah to the Parsha: In this week’s Torah reading of Chayei Sarah, we are told of Avraham's (Abraham) old age and the Haftorah speaks of King David's last years. The storyline of this week’s Haftorah: In return for tearing off the corner of King Saul’s (Saul) robe, King David always felt a chill in his bones. The Haftorah begins with the story of King David being brought a beautiful woman named Avishag in order to warm him in his elder years. She came from the city of Shunem and possibly was the sister of the Shunamite Woman mentioned in last week’s Haftorah, although there was a least 100 years that separated the two sisters) . Even though it is not his place, King David's eldest sons, Adoniyahu (it was common to end Hebrew names with Ya’hu. Translated, it means “the [Jewish] G-d is the one”) was trying to seize the throne away from his younger brother Shlomo. One of the wives of King David, Queen Batsheva (Bathsheba), Shlomo‘s mother and the Prophet Natan (Nathan), confer regarding Adoniyahu’s will to become king. They decide to bring it to King David's attention. Natan confirms to David the news that Batsheva has told him regarding Adoniyahu’s ambition. Bathsheba pleads with David to fulfill his promise of her son Shlomo (Solomon) being heir to the throne. Kind David promises Batsheva to rectify the situation. He takes action by anointing Shlomo as the next King of Israel. A statue of what a king looked like in the Middle East 3000 years ago. Notice the crown and the gemstone in his belt and no shirt; it was hot out there at the palace. Was a descendant of Ruth the Moabite. David's father's name was Ishay; his mother's name Nitzevet bat Adel. David was a "Gingie" (a redhead). As a youth, David was a shepherd, tending to flocks of sheep. Famous Phrases: Psalm 119 of Tehillim, “Ashrai temimai derech haholchim b’torat Hashem” "Praiseworthy are those whose ways are perfect, who can walk with the Torah of Hashem." Kind David sang this celebratory song after he brought the Holy Ark containing the Ten Commandments to the city of Jerusalem. Haftorahman’s lesson of the week: Spiritual self-sufficiency or spiritual continuity? We are all proactively working on ourselves to develop our closeness to Hashem. It is not enough to lead ourselves through life, it is important that we personally enroll our own children to participate. We must prime the next generation to continue the Jewish way of life. This is not something to be delegated. There is no such thing as not having time. We must carve out some time, specifically to educate our own children in our own homes. We should be mindful to ensure that they receive Jewish education and guidance so that they will be prepared to lead a life ripe with Torah laws and customs. Then they can lead themselves through life and their own children. Think to yourself: Are you educating your children or do you leave that job to others? Timeline: This story took place in the Hebrew year 2924, about 2838 years ago.